Over the past 7 years , InfoSight has been developing technologies to bar code mark CRT component glass.We now have low cost solutions which will mark high contrast , non-contaminating, barcodes on CRT components. •AMBIENT temperature glass applied marks which will survive later lehr passes (~600C). The focus here is on CRT panels however the same technology is appropriate to hot funnels. The coating formulation is different for panels ( ~ 380 to 520 deg. C) and funnels ( ~290 to 380 deg. C). The technology involves the use of a specially coated tape. 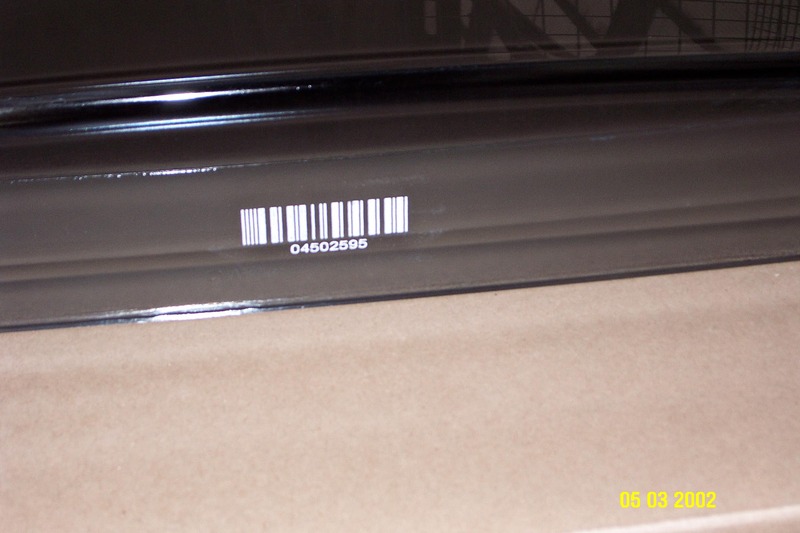 A negative ,mirror , image of the desired barcode and the associated man readable characters is " laser burned " into the coating to abalatively remove all of the coating which is not to be applicator transferred onto the hot glass. The laser beam never contacts the glass. We offer two applicators: (a) The simplest , simply applies precut (produced off-site) sequential tapes and no laser is required. (b) The addition of a Laser permits on-site ( variable data) markings. Each panel is stopped and the imaged tape is momentarily pressed against the hot glass to transfer the coating mark onto the glass. Total "stopped glass" time is under 3 sec. Picture above is the resultant marking after the lehr. Note that the barcode is a "negative" Code 128C symbology wherein the bars are white and the background is black. Many (inexpensive) commercial bar code scanners can be setup to read the negative image. The negative image greatly reduces the amount of marking material ( and potential stress to the glass) . The focus here is on CRT panels . Our cold glass technology again uses a tape which is ablatively imaged either (a) off-site with sequential numbers or (b) on-site with a laser in the customer's plant. The imaged tape pattern is then transferred onto the cold (ambient temperature) glass which is stopped for approximately 2 sec. . After transfer , the mark is waterproof and will endure handling. After the first lehr pass ( ~ 300 deg. C) , the mark becomes hard and scratch resistant. 1. It produces a mark which will not flake or cause apature blockage. 2. It is low in cost when compared to "ceramic labels"
Pictured above is the resultant cold glass marking before a lehr. Note that the barcode is a "negative" Code 128C symbology wherein the bars are white and the background is black. 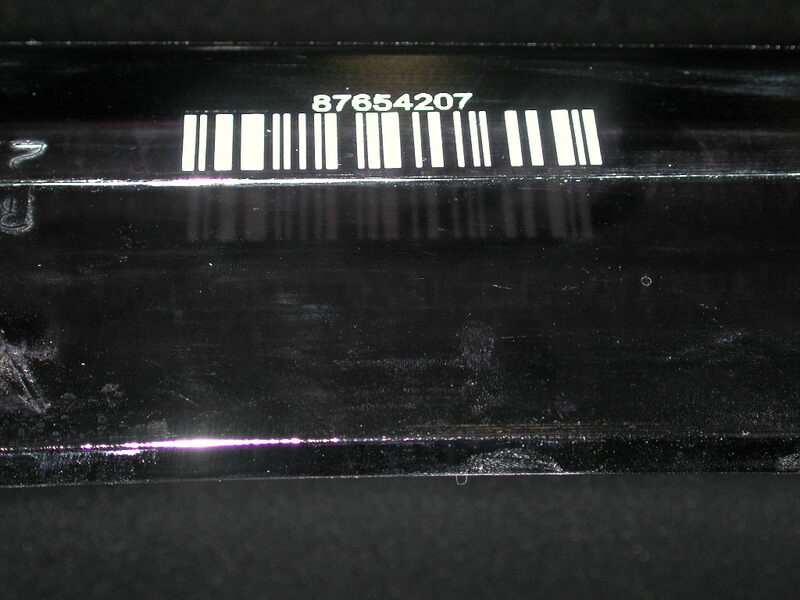 Many (inexpensive) commercial bar code scanners can be setup to read the negative image.